Recently I attended the IAFP Symposium in Vancouver, BC. It is one of the top conferences for Canadian financial planners and was, as always, packed with valuable content. I wanted to share with you the key takeaways from the conference, so you are aware of the current developments, trends and opportunities in the Canadian financial planning industry that you can hopefully use for the benefit of your own practice. 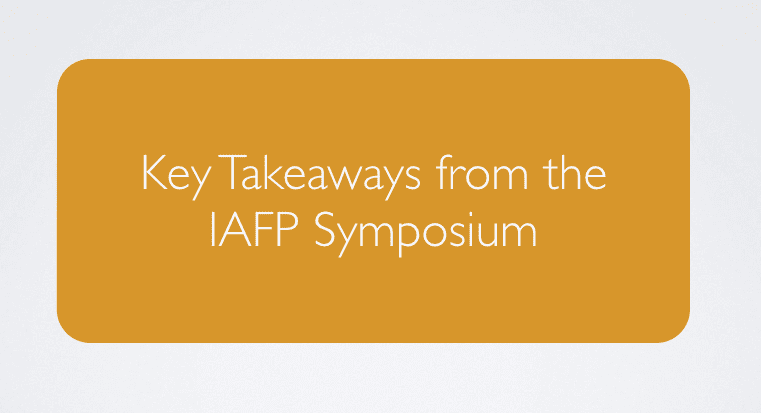 There are two things that I think the Institute of Advanced Financial Planners (IAFP) nailed when it comes to structuring the conference. First, there is a realistic case shared with all participants before the conference that presenters can refer to in their presentations (this year’s case was about a moderately dysfunctional family and their family businesses). Although fictitious, the case was realistic enough to provide an arena to exercise different financial planning strategies and approaches. Since the attendees have the chance to review the case before the conference, they are generally familiar with it, and the presenters can go straight into addressing the challenges in the case without spending additional time describing the problem. This ends up being a massive time saver and makes knowledge sharing more efficient. Second, the symposium offers an optional Advanced Education Day before the actual conference. If you want to get more proficient at your craft, you can come a day earlier and learn more. In terms of industry trends, there was no single overarching theme at the conference this year. It seems CRM2 (not applicable to a large portion of the attendees) is old news and everyone has gotten used to robo-advisors co-existing in the market. Potentially worth emphasizing though is a more subtle underlying trend towards goal-based planning and investing that transpired in several sessions. I wouldn’t even call it a trend, per se. It’s more of an evolution or natural progression in well-functioning wealth management practices. It seems goal-based planning will play an increasingly important role as the industry evolves and especially after the CRM2 is fully implemented, primarily because it is very client-focused and therefore tends to better address client needs. Gregg Filmon, President of Value Partners Investments, drew a parallel between the financial advice industry and the medical industry, suggesting that the former could learn much from the latter as the medical industry is deeply process-driven. He unveiled the process he applied at his company: it starts with clearly defined goals that are client-focused (not advisor-focused) and involves proven battle-tested methodology offering clear benefits and results to clients. It also includes managing client expectations by educating them about possible outcomes and enlisting their support via mutual accountability. The approach he outlined is simple, effective and powerful. Sam Sivarajan, Managing Director, Head of Manulife Private Wealth, brought an interesting perspective to inter-generational wealth transfer by focusing on behavioural finance aspects that affect investor decision making. There are many cognitive biases that cost investors, including the anchoring effect, the IKEA effect, the overconfidence bias and the action bias. The role of an advisor is to be aware of these biases and help properly manage them for clients. Sam made an interesting remark about risk questionnaires that is worth mentioning. Although required by regulators, he pointed out that the questionnaires are generally not very useful at determining different cognitive biases, and their overall value might be limited in a goal-based investing approach. Tom Bradley, President of Steadyhand, offered a useful perspective on portfolio construction in a near-zero interest rate world. After 35 years of declining interest rates and excellent bond returns, he claimed investors need to shift gears. His presentation focused on the role of fixed income in portfolio design; he discussed the return expectations for fixed income and argued that the 2016 FPSC guidelines of 4% as the rate of return for fixed income are overly optimistic. Fixed income traditionally constituted a large portion of portfolios and played an important role in diversification and protecting the downside. If fixed income may not qualify for the job anymore, what are the alternatives and can they do a better job? If so, how do they fit into overall portfolio design? Tom went on to describe alternatives, giving scores for various investment instruments like GICs, mortgage funds, high yield bonds, dividend stocks and multi-strategy hedge funds. He rated them based on three components: expected return, diversification and downside. Overall, this was a valuable session and I highly recommend reviewing his slides if this interest you. Josh Schmidt, tax lawyer at Moodys Gartner Tax Law LLP, defined the three most pressing tax issues facing the family in the fictitious case. The issues were around selling the business to their employees (which may require significant tax considerations), important tax elements to a divorce and tax issues surrounding estate freezes. He highlighted these key issues and individually discussed the purpose, considerations and mechanics when applying any of these strategies to other similar cases. John Burns, Senior Financial Planner with the Office of the Public Guardian and Trustee, presented one of the most engaging ethics sessions I had the pleasure of attending. The brilliance of this session relied on a comparison of the IAFP and FPSC codes and standards for its professional members. For those who are unfamiliar, the IAFP administers the Registered Financial Planner (RFP) designation, and the FPSC is a professional standards-setting and certification body that certifies Certified Financial Planner (CFP) professionals and FPSC Level 1 Certificants. While certain professional standards revealed close similarities, (For example, “IAFP Canon 1 – act in the best interest of the client” and “FPSC Principle 1 – A CFP shall always place the client’s interest first”), other standards differed, where the wording chosen by the IAFP seemed clearer and stricter (For example, “IAFP Canon 3 – disclose all sources of compensation relating to client relative to recommendations made and services provided (…)” and “FPSC Rule of Conduct #8 – When doing financial planning – A CFP shall disclose in writing – an accurate and understandable description of the compensation arrangements being offered (…)”). I found this comparison very interesting, especially in light of FPSC lobbying to regulate financial planners and to establish a single harmonized set of standards for individuals who can call themselves financial planners. What makes financial planning particularly hard is the fact that it operates at the confluence of three large disciplines: economics, accounting & tax, and law. Client cases may require an individual to have deep knowledge in all of these areas, while achieving proficiency in any of these individual disciplines may take years of practice. To help planners, especially younger and less experienced ones, maintain high standards and keep track of different planning strategies and approaches, we decided to start gathering a set of best practices. This is one of the reasons behind the Best Practices in Canadian Retirement Planning Project, which Snap Projections launched earlier this year. This project is intended to gather best practices in retirement planning among Canadian financial planners and freely share these practices with the rest of the industry. We recognize that no matter what tools you use to create retirement projections for your clients, there is value in having a set of best practices and guidelines that is technology agnostic, meaning that you can apply them using any technology, even an Excel spreadsheet. If you would like to participate in this project, please let me know by contacting me at this email. We’ll arrange an interview with you to document the principles and strategies you use when helping your clients plan for retirement.